We provide, install, and configure complete home automation systems, chosen to meet your specifications. This includes software, hardware, and peripherals, ready for you to take advantage of today's technology for better living and lower utilities cost. With home automation, your life is made easy. You can monitor and control your home from anywhere using your cell phone or any telephone. Your home can notify you when there is a problem giving you the security everything is always ok with your home and living space. The T4 is RTI's flagship wireless controller - a culmination of many years of engineering and design experience. 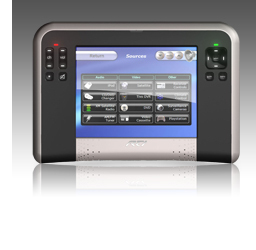 It provides the ideal solution for those that require the very best in wireless touchpanel control. Sleek and sophisticated, the T4 is the perfect compliment to today's flat panel televisions and high-end home theaters. The highly stylized design, user-friendly ergonomics, and intuitive operation all work together to provide the richest possible experience. The T4 provides a self-contained control system for controlling audio/video components, lights, and other electronic systems in the home. It also displays wireless video (motion JPEG) and web pages - either full screen or in an adjustable window. With a TFT LCD, full VGA resolution, powerful 400MHz 32-bit MCU, 32MB of Flash memory, stereo speakers, and an expandable architecture, the T4 defines the state-of-the-art in touchpanel control.